Is this comprehensive security suite worth the outlay? It's well worth spending money for the extra features provided. When it comes to anti-virus software, we're supporters of Grisoft's free software because it does such a good job. Therefore, we were intrigued with Grisoft's latest suite of paid-for tools and wondered if it would be worth the expense. As you would expect from a security suite you're not just provided with one weapon against the various scourges of the Internet, but in fact four: anti-virus, anti-spyware, anti-spam and a firewall. These are applications in their own right, but they can also be accessed quickly and easily through the one interface. When you launch the software you're faced with Grisoft's Test Center. Depending on how confident you are with tools such as this, you can switch between either the basic or advanced mode. As the name implies, basic mode makes things very easy for you. It provides you with three options: Scan Computer, Scan Selected Areas and Check for Updates. If you want to run a quick check of your system simply click the scan icon and it'll start. This will use the default scan settings, which are actually comprehensive in nature: the program will delve into the darkest depths of your system. 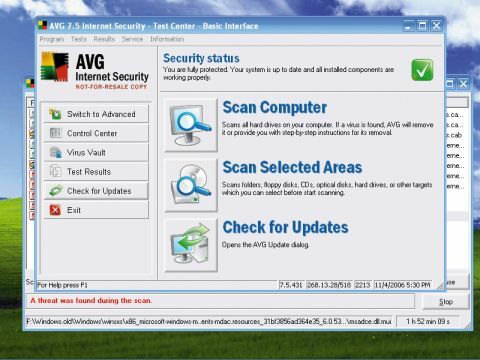 You do have complete control over which areas of your PC you want AVG to search, and furthermore you can choose to set it to scan at certain times of the day. By default, if AVG finds anything that shouldn't be there it'll automatically heal infected files. To see exactly what the software has found you need to open up the Virus Vault. This isn't as dangerous as it sounds - it's simply a window that displays the files that have been removed. Files that AVG finds aren't deleted immediately. This is a safety option, should the program pick up a file that's benign or perhaps even a core part of some other software that you have running on your PC. If this is the case then there's a one-button option to return the file to wherever AVG took it from. If you know it's a virus and want rid of it, you can highlight the item and then delete it for good. This is all, of course, for scanning for viruses and spyware, but they are just two parts of the system. A firewall is also included in the package. Unlike the spyware and virus scanners configuring the firewall isn't straightforward. By default, if the firewall doesn't recognise something that's trying to leave your PC, it'll ask you if you want to allow it to. When you first install the suite you'll get a lot of this as the program learns what's on your PC. However, after a few minutes it should know what browser you use and so on. You can then configure it to allow everything that wants to connect to your PC. This isn't a good idea. Finding out what's going on with the firewall isn't easy. Nothing informative is shown in the main Test Center window; instead, you have to switch to the Control Center and click Firewall in the list and then click Configure. The same is true for all the other features such as Anti-Spam the Resident Shield, which is a rather grand name for the email scanner. AVG Internet Security 7.5 comes with a two-year licence, in which time you're covered for all new definitions and program updates. When this ends users will receive a 50 per cent discount when they renew, which is good value. On the whole we were impressed with what AVG has to offer. The tools are robust and easy to use, which is what you need in order to stay secure.